Danfoss OMR hydraulic motors (medium sized) are available in various versions and with various options, 2-bolt oval, 4-bolt oval, square flange and wheel. Online we are selling the 2-bolt versions but if you require alternative versions please call us because as Tier 1 Danfoss distributors we will more than likely have it stock, available to ship out to you the same day. For more technical information please see the data sheet in the Download tab on the product page. 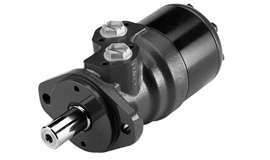 All hydraulic motors below come with the side port as standard, again if an end port is required please contact us. Please call your local branch on Gloucester: 01452 730774 Birmingham: 0121 327 2664 Durham: 0191 410 6619 Leeds: 0113 2707295 or alternatively please email enquiries@grouphes.com for any further information or technical assistance on Danfoss OMR motors.